Home - Recycling: how green is your double glazing firm? Recycling: how green is your double glazing firm? 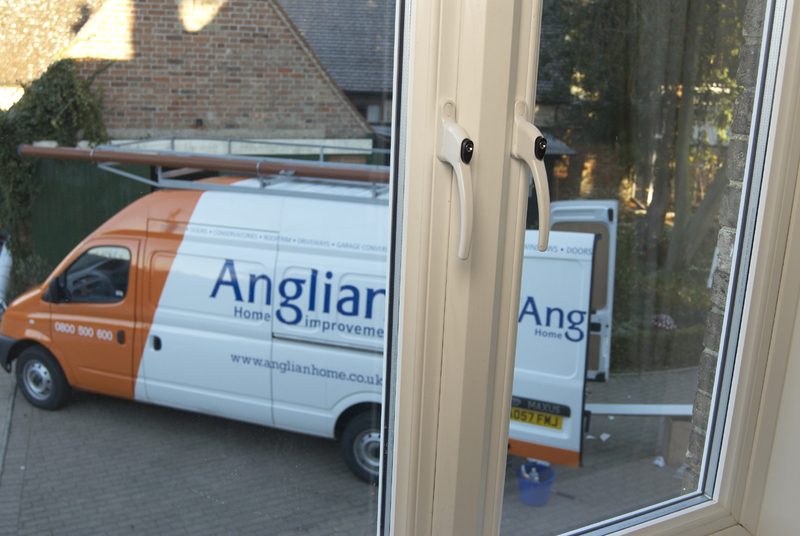 ‘Raising the Standard’ is the Anglian Home Improvements company motto, which extends through all areas of the business from the design of the product to how we dispose of your old windows and doors when new ones are installed. Have you ever wondered what happens to your old double glazed windows and doors when they are taken away from your home? Have you ever asked where they end up? There is a “feel good factor” to be had from knowing that your old windows and doors are being properly disposed of by your chosen home improvement firm, so you know you are doing your bit to help preserve the environment. Surprisingly, the majority of companies simply take away your old windows and doors and put them into a skip. When the skip is full it is taken to a land fill site and dumped. We spotted these old windows and doors waiting to be put in a skip. Some more unscrupulous tradesmen even dump or fly-tip your old windows and doors on the side of quiet country roads or in lay-bys, causing a problem to the local environment. If you are very unlucky, in some cases the dumped items can be traced back to you, which in turn may result in you being prosecuted (which we think seems a bit unfair). Old uPVC frames and glass is not bio-degradable and if dumped will be around for centuries to come. We don’t think that sounds very green. Unlike some traders, we do care where your old windows end up and what happens to them after they leave your home. Anglian is very proud of its green credentials and is environmentally conscious about the waste that is produced in the replacement of old windows & doors. We do our utmost to avoid making waste in the first place as no waste at all is clearly the greenest way of working. 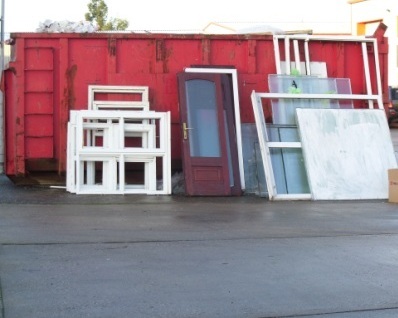 But in reality, this is not always possible and so Anglian has invested time and money to ensure where possible any waste, including your old windows and doors, is sent for recycling. What happens to your old double glazed windows and doors? When your old windows are taken out of your home, the glass is removed and then the frame, along with any metal work associated with the window frame itself. The frame is broken up and put into a recycling bag on the van. Once it has been retuned to the factory it is taken to the recycling area, where the frame is broken down into its original components. This is our company certificate to confirm that we recycle towards the UK Recovinyl initiative. The uPVC from old Anglian window frames is sent to be shredded and ground down into tiny pieces and then melted into a new form. Recycled uPVC is reincarnated into many things including non-visible parts of new window frames that cannot be seen from the outside, plastic garden furniture, window boxes and many other items. 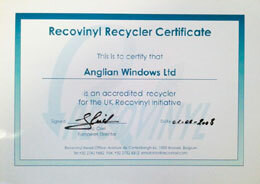 Anglian work with a company called Recovinyl, who provide incentives to companies to support the collection of PVC waste. Its aim is to ensure a steady supply of post-consumer PVC waste for recycling in Europe, providing a valuable alternative to disposal in landfill. One of our company vans ready to take away the old windows ready for recycling. What happens when your old glass leaves us? The glass from old windows is collected from our factory and returned to the manufacturer. Once there, it is melted down and remade into new windows and other glass objects. We hope you will see us as a company that does care for the planet and that by recycling your old windows and doors we can all help to make the world a greener. Next time you replace your windows, make sure you ask where the old ones will end up.